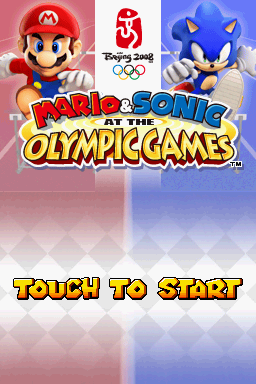 Not to be confused with the Sega Mobile title Sonic at the Olympic Games. 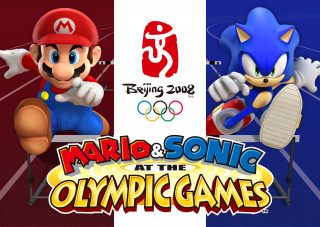 Mario & Sonic at the Olympic Games, known in Japan and South Korea as Mario & Sonic at Pekin Olympics (マリオ＆ソニック AT 北京オリンピック), is a sports game that places Mario, Sonic, and their various allies against each other in Olympic events. The game has the official Beijing 2008 Olympics license, and features environments based on actual Olympic venues. Originally, Mario & Sonic at the Olympic Games was considered an April Fools Joke by most fans, as the game was revealed late March. However, soon after, Sega stated on their official website that the game is official, and that both Sega and Nintendo are working on this game project. Shigeru Miyamoto then confirmed that he was supervising the project. 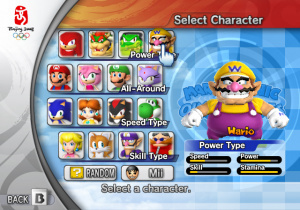 Mario & Sonic at the Olympic Games is available for both the Wii and Nintendo DS. Both versions of the game utilize the new functions of these consoles completely. Mario & Sonic is compatible with Nintendo Wi-Fi Connection. The playable cast consists of sixteen characters; eight from the Mario series and eight from the Sonic series. These sixteen characters are broken up into four groups of four characters. All-Around, which consists of characters who neither excel or descend in any type of abilities. Speed, which consists of characters who are best at agility and stamina based events. Skill, which consists of characters who are above average skill and stamina, but have low power and top speeds. Power, which consists of characters who are best at strength and endurance based events. There is also the choice of using the players own Mii as a playable character. When they are chosen, they seem to have no stats, so stats do not affect them, or it is safe to assume that they have 5/10 in all areas. In Dream Fencing and Dream Table Tennis, players can use special attacks, which are powerful moves that inflict more damage (Dream Fencing), or hit the ball with more power (Dream Table Tennis). In addition to the above characters, the following were found in when hacking the European version of the game: Silver the Hedgehog, Donkey Kong, Birdo, and Jet the Hawk. Some of these characters became playable in the next game. Swim two lengths of the pool in the fastest time. Four team members take turns to swim two lengths each. Each player should touch the wall before the next player dives in. The first team to have all four members complete two lengths wins. Shoot four sets of three arrows into a target at 70 meters, aiming for the center circle for maximum score. The player with the highest total score wins. Kick off from the starting block and sprint along the 100-meter stretch to the finish line in as short a time as possible to win. From a staggered start, kick off from the starting blocks, then endure a 400 meter run to the finishing line. Four team members take turns sprinting with the baton in their own 100-meter stretch. Sprint to where the next team member is waiting. The last member to carry the baton should sprint to the finish line. Kick off from the starting blocks and sprint towards the finish line as quickly as you can, leaping across the hurdles positioned along your path. Kick off from the starting blocks and complete a 400-meter race to the finish line, leaping across the hurdles positioned along your path. Sprint down the runway and jump before you reach the designated takeoff mark to avoid a foul. Try to jump as far as you can into the sand pit. The best of three attempts will be recorded. Sprint down the runway towards the designated takeoff mark. Take a hop, step, and jump into the sand-filled pit. Start your first leap before the takeoff mark to avoid a foul. The best of three attempts will be recorded. Jog down the runway and leap over the crossbar, taking care not to knock it off its supports. You can set your own starting height, but this is increased with each successful jump. When you fail to clear the crossbar three times in succession, the last height you successfully cleared will be recorded as your score. Run down the runway and plant your pole in a box set in the ground to help you vault over the crossbar without knocking it off its supports. You can set your own starting height, but this is increased with each successful jump. As with the High Jump, your score will be determined after three successive failures. Take the hammer in hand, spin on the spot to build up momentum, and release the hammer in the direction of the landing area before the countdown runs out. The further away it lands, the better your score. The best of three attempts is recorded. Sprint down the runway to build momentum and throw the javelin as far as you can into the landing area. Time your throw carefully to avoid crossing the foul line, or the attempt will not count. The best of three attempts is recorded. Brandishing your epée, aim to touch your opponent anywhere on their body with the tip of the blade to score a point. Use your defense skills to prevent your opponent from doing the same. The first player to gain 15 points wins the round. Use the trampoline to propel yourself high into the air and perform complex spins and somersaults. Your performance is judged on how precisely you execute your moves. As you land, be sure to prepare yourself for the next set of moves with a good high jump. Run up to the springboard and vault across the horse, performing spins and somersaults in the air. A maximum of 10 points will be awarded, depending on your mid-air performance and the skill of your landing. The best of three attempts is recorded. Constant skill, as well as raw power, is required to make the continual adjustments necessary to keep your skiff moving in a straight line. Work your way along the course and cross the finishing line before your opponents to win. Make your way through eight stations, firing at high and low airborne targets as they’re released. You only have enough ammunition for one shot per target, so aim carefully. The player with the most total hits wins. Use your paddle to bounce the ball across the net into your opponent’s side, and win a point if they fail to return it or allow it to bounce twice. The first player to reach 11 points wins the round. Each player takes turns serving twice. 1,541,600 Guinness World Records: 2010 Gamer's Edition (Webcite Archive) Wii/DS N/A 11,310,000 Source reports that the total amount of units sold for the Wii version is 7.07 million and the total amount of units sold for the DS version is 4.22 million. This page was last edited on 17 March 2019, at 11:07.